January 14th-January 17th marked the Second Annual Star Wars Half-Marathon at the Disney Resorts in Anaheim, California. Runners and Star Wars fans from all over the world traveled to the western United States to participate in some of the most entertaining races you'll ever run in. Why are these races so much fun? Let's take a look! Upon first arriving at the Disneyland hotel, guests were directed to a lower level to pick up their packets containing their racing bibs, pre-oreded merchandise, and the program for the weekend's festivities. If you were participating in the "Rebel Challenge" (running the 10k and Half-Marathon in consecutive days), you also were instructed to get your photo taken. This was to ensure that you didn't have a proxy run the races for you. For all those female fans out there, the exclusive Star Wars Half-Marathon 2016 Dooney and Bourke purses were available for purchase in this area as well. After you were given your bib, you were instructed to go upstairs to the "Health and Fitness Expo" area to receive your race t-shirts and safety pins (to attach your bib). The entrance to the upper levels had amazing displays. Each race had it's own "banner" display with an over hang that lead into this building. The Health and Fitness Expo contained mostly vendors selling fitness related merchandise. One of the highlights in this area was the SMS Audio booth. SMS Audio produces very high end Star Wars headphones that are fantastic! The official "Event Merchandise" area was in the same area as the Health and Fitness Expo, but it was closed off with a separate line to get in. 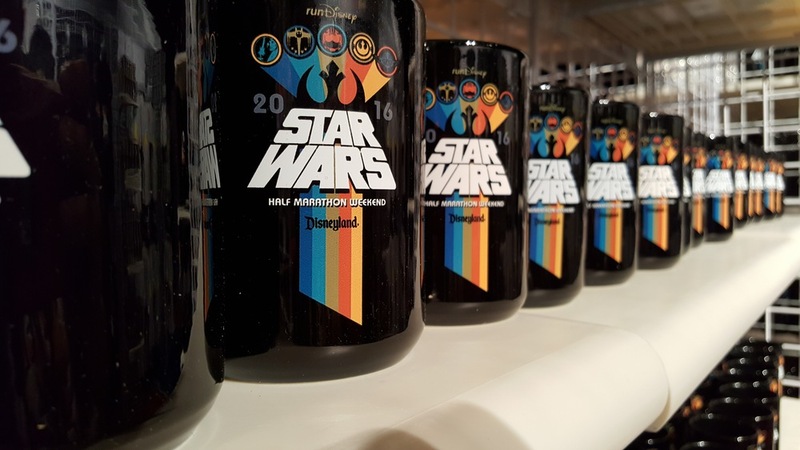 The Event Merchandise area contained items related specifically to the 2016 Star Wars Half-Marathon at Disneyland. These items included: clothing of all kinds, coffee mugs, headbands, wine glasses, exclusive pins, car magnets, artwork and more. As if things couldn't get any cooler, right outside the Event Merchandise area was a Star Wars background that fans were able to snag a photo in front of. The day of the races were absolutely fantastic. Prior to going to your corral (at 5 A.M.), fans made their way to the Main Stage. The main stage area was decked out with Star Wars banners, sets and bright lights. A DJ was jamming out to music to get people excited about the races andeven some First Order Stormtroopers came out onto the stage for a brief show. The Star Wars Half-Marathon hosts (Rudy Novotny and Carissa Bealert) brought lots of energy to the atmosphere and did a great job getting runners excited for their upcoming adventures. When the show at the main stage was over, runners made their way to their corrals. Generally, waiting in corrals is a boring thing, but there was a big screen at the starting line that kept runners occupied. This screen showed clips from movies, trailers for The Force Awakens, and a brand NEW Rebels Season 2 trailer! Fans erupted out of excitement upon seeing the new footage. Rudy and Carrisa were there getting runners excited and the National Anthem was also sung at this location. To watch the new Rebels trailer, look below. NOTE: New trailer contains spoilers of what's to come in the new season. The races themselves were absolutely incredible. Whether you want to stop and take photos or just b-line it to the finish line, these races were for you. The races included: Kids Races, a 5k, 10k and Half-Marathon. These adventures (with the exception of the kids races) began at 5:30 A.M.. Characters like Boba Fett, Chewbacca, BB-8, R2-D2, Sabine and Ezra, and First Order Stormtroopers were stationed along the course for runners to stop and greet. Sets like the Trash Compactor and an Endor scene with speeder bikes were also along the course to snag a photo with. Many fans ran in some sort of costume. It's always great to see fans display their fandom even when running 13.1 miles! The mile markers were Star Wars themed and were different styles depending on the race you were running in. Everyone seemed to have a great time and it's very apparent that this race is growing! The Dark Side races will be Star Wars themed races at Disney World in Orlando, Florida this April. Make sure to keep up with all your Star Wars news and reviews with Twin Suns Outpost!